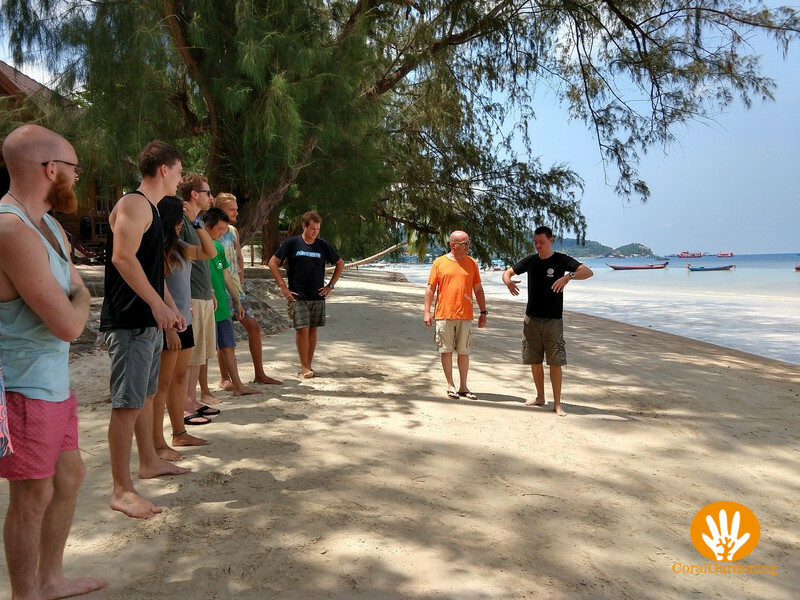 After eight years of having our Divemaster certificate, we decided do our instructor development course. Marcel from IDC Sairee Cottage Diving is known as a good course director, who gives all time and attention his students need. After a good conversation with him, we decide to do the PADI IDC course with Marcel. The group consists of 10 students. 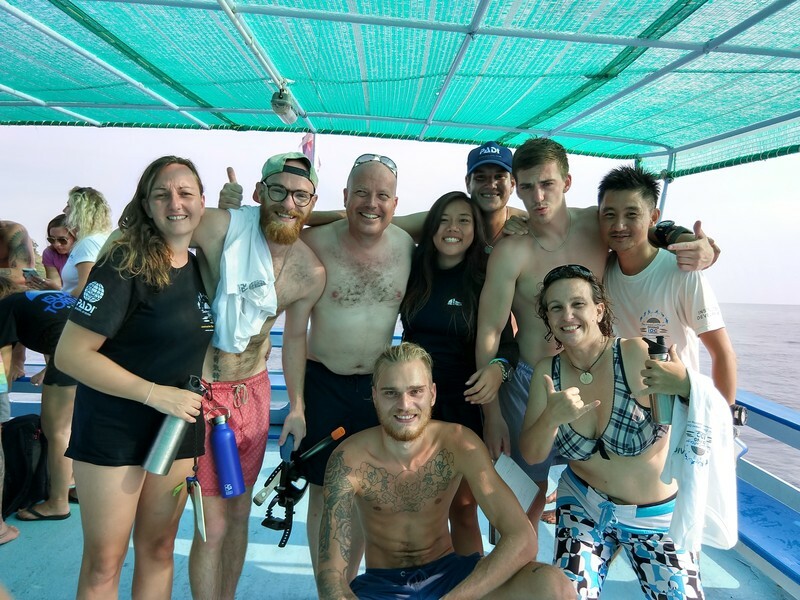 This sounds like a big group, but because of the way Marcel teaches and his team of PADI Staff Instructors who are assisting, we got all the personal attention that was needed, and more. What was also great was that we had an international group of German, Danish, South African, Dutch, Thai and Chinese. Marcel put his soul and enthousiasm in the training. 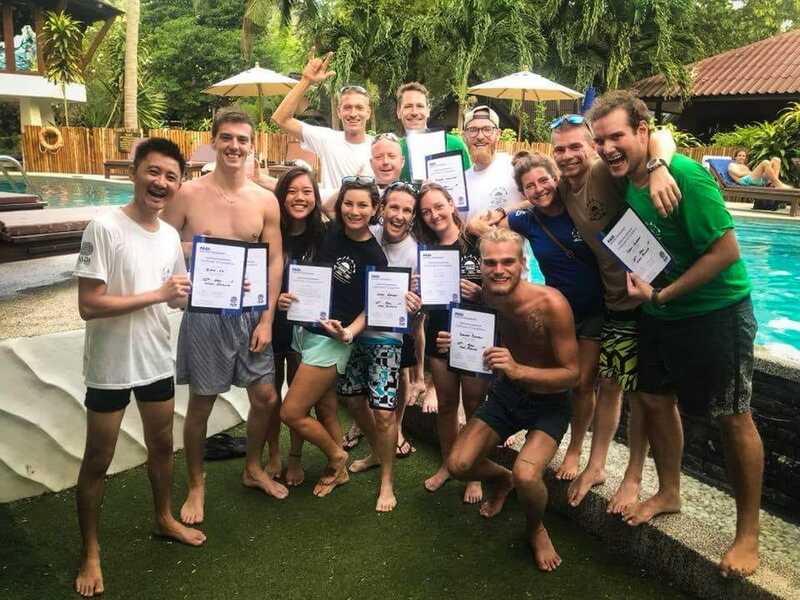 We are being prepared to survive the PADI exams and Marcel tells with appealing examples why it is so important to keep to the safety regulations and how to become the best possible instructors. The amount of theory is quite tough, often there is a group of people studying until 10 o’clock in the evening. Thanks to the inexhaustible efforts of the assistants Josef, May and Maddy, we master all theory. Our international IDC group, vlnr: Stine, Tom, Frank, Luke, Sean, Casey, Banson. And in the front George en Vera. We, as students, are not always easy and Marcel’s good explanation is intentionally interpreted the wrong way, more than once. To the hilarity of the other students. During dry practice of the skills on the beach, there is a moment when it goes completely wrong. IDC exercises on the beach. 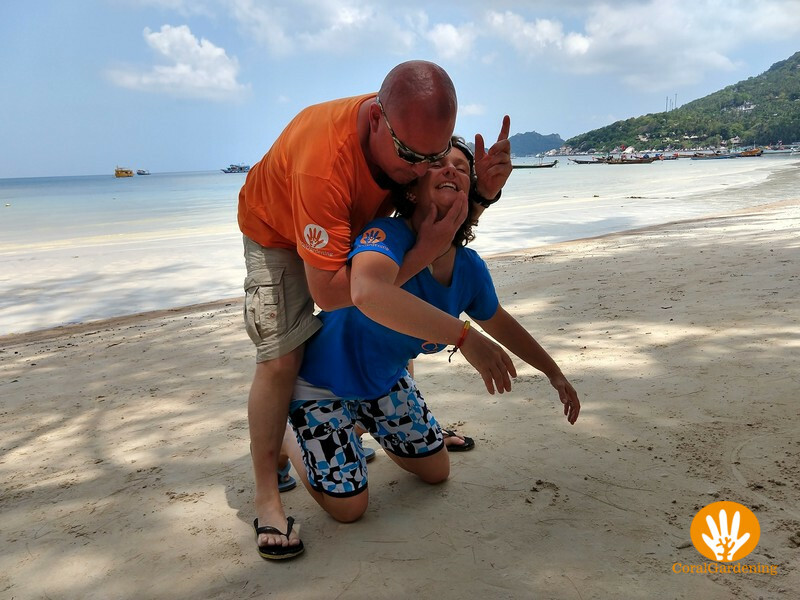 George needs to play an unconscious diver and Marcel shows what steps you have to go through to bring the diver to the surface. But George is less unconscious than he should be and before Marcel knows, he is lying on his back on the beach with George on top of him. During the course it never feels like we are “students” and Marcel is the “teacher”; it feels more like a group of friends, who have a great time together, joking and learning new things in the meantime. The training involves a lot of practice under water. Each time one of us gets the role of instructor and has to teach “awkward students”. Each students receives an “assignment” to perform the exercise wrong, like not being able to clear your mask, not blowing bubbles if you don’t have your regulator in your mouth, etc. The dive instructor must quickly recognize the problem and solve it. On one occasion it almost goes completely wrong. I am the student who must pretend that I have no more air and then go over to do buddy-breathing with my buddy. It sounds very easy, but when I take the alternative air supply from my buddy, unnoticed the mouthpiece became half loose. Without being aware of it, I put the mouthpiece in my mouth and exhale forcefully. When I inhale, I get a big gulp of water in my mouth. I still think “Apparently I did not exhale properly.” So once again I empty my regulator and inhale again, with the same result. “How is this possible? I would like to have some air now.” Fortunately, Tobias, who has the role of instructor, responds very quickly and adequately and puts a working regulator in my mouth. Tobias, as far as I am concerned, you have already passed your exam! Beach exercise: “How do you bring an unconscious diver up to the surface? The exams refer to school phobias. It is 2 days of sweating. More than 70 men/women in a room to do theory exams. You can almost smell the sweat. 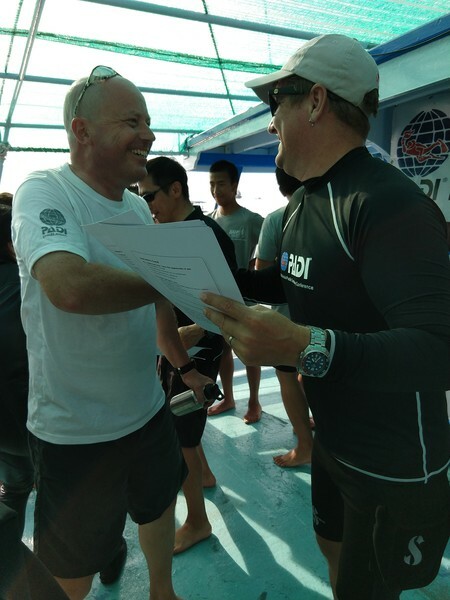 The PADI examiners do their best to reassure you, but that doesn’t really work. I am very relieved when I hear the final judgment and that I have passed the theory, eventually with flying colors. Through a “lottery” we are told which exercises we have to do for the practical exam. Unfortunately, I get an exercise where many things can go wrong and where you have to do the exercise completely over again. An extra challenge. In the afternoon we show our skills in the pool. The next morning we present our presentation skills in the classroom and in the afternoon we go into the sea for the final challenge. I can’t tell you how happy we are when we have all passed our exam! Now we can train non-diving volunteers for CoralGardening ourselves. We can also help more experienced divers to a new level. Everyone is welcome! 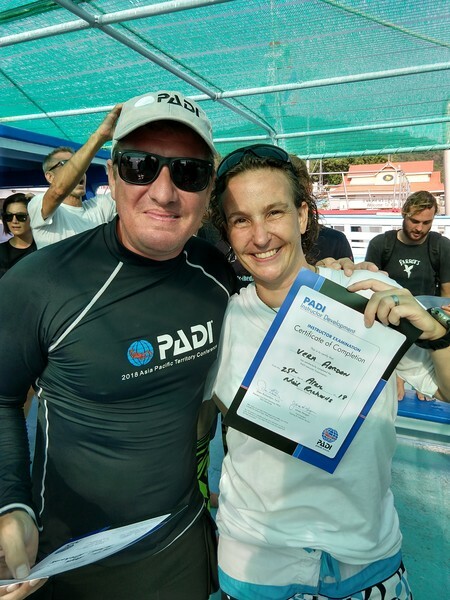 If you want to become a PADI Dive Instructor (IDC) yourself, contact Marcel. Marcel and team, thank you so much for the nice inspiring lessons and thank you for your endless patience with us. We had a great time despite studying hard.